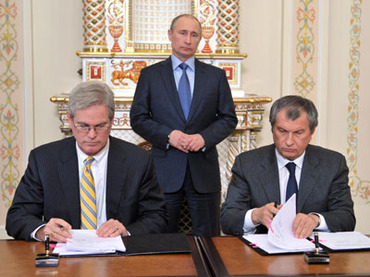 Image: Russian President Vladimir Putin and ExxonMobil Exploration Company President Stephen Greenlee. Rosneft has reached an agreement with Exxon Mobil to acquire a 25% stake in the Point Thompson Alaska oil and natural gas field. The deal is part of the larger cooperation on exploring the Russian Arctic shelf. ­The head of Rosneft Igor Sechin and the President of ExxonMobil Stephen Greenlee have signed an agreement on joint exploration of new sectors of the Russian Arctic shelf, expanding the 2011 strategic partnership agreement. 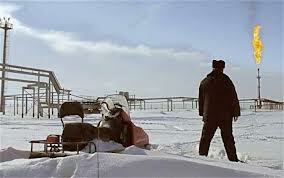 Under the deal Rosneft gets access to one of the largest fields in Alaska which is currently operated by ExxonMobil. Participation in the project will let Rosneft develop up to a quarter of the proved gas resources of the Alaska North Slope, as well as get the latest technology for exploiting liquid gas fields in bad weather conditions, according to Igor Sechin. 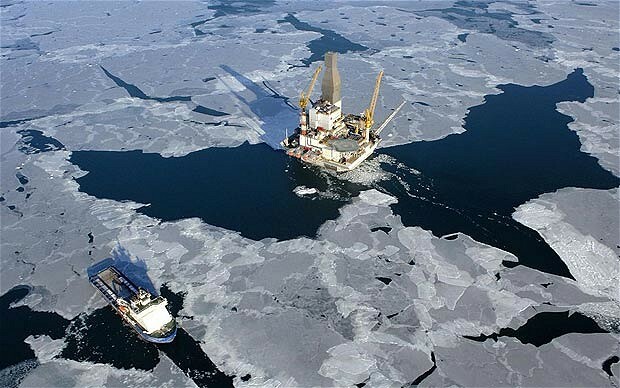 In return, ExxonMobil gets the rights to explore 600,000 acres of land in the Russian Arctic, including the Severo-Karsky block in the Kara Sea, three blocks in the Chukchi Sea and two in the Laptev Sea, all of which are “among the most promising and least explored offshore blocks in the world. According to Sechin, the agreements “take the unprecedented Rosneft and ExxonMobil partnership to a completely new level.” “The acreage in the Russian Arctic subject to geological exploration and subsequent development increased nearly six-fold,” Sechin added. Point Thompson is a large oil and gas field in the Northern part of Alaska, which was discovered in the 1960s, which has been recently cleared for development after a legal battle between ExxonMobil and the State of Alaska. In 2012 the State, Exxon Mobil and other Point Thomson stakeholders agreed that natural gas production can begin by spring 2016, or the State could begin to take back leases. The field is estimated to hold a potential 8 trillion cubic feet of natural gas which is a quarter of the known reserves in the region, and also hundreds of millions of barrels of oil. If the estimates are correct the area could be worth more than $100 billion. An oil production platform at the Sakhalin-I field in Russia, partly owned by ONGC Videsh Ltd., Rosneft Oil Co., Exxon Mobil Corp. and Japan’s Sakhalin Oil and Gas Development Co.
Rosneft is seeking to borrow up to $30 billion from China in exchange for possibly doubling oil supplies, making Beijing the largest consumer of Russian oil and further diverting supplies away from Europe. Four industry sources familiar with the situation told Reuters that Rosneft was in talks with Chinese state firm CNPC about the borrowing, which would echo a $25 billion deal the two companies clinched last decade. Rosneft said it was not currently in talks about obtaining a loan from China but declined to comment when asked whether it may enter in negotiations at a later date. In the previous deal, Rosneft and Russian pipeline monopoly Transneft borrowed money to help Rosneft acquire the assets of nationalized oil producer YUKOS while agreeing to build a pipeline to supply China with 300,000 barrels per day for 15 years. This time, Rosneft wants to borrow money as it is close to completing a $55 billion acquisition of rival TNK-BP to become the world’s largest listed oil producer. BP-Rosneft deal: Who are Rosneft? Back in 2003 few people had ever heard of Rosneft. A state-owned (Russia), relatively minor player in Russia’s oil industry, the 10 year old company was dwarfed by its privately owned rival Yukos, which was controlled by the country’s then richest man Mikhail Khodorkovsky. That all changed in December of that year. A $27bn tax claim against Yukos set off a chain of events that would eventually lead to the bankruptcy of the company and the jailing of Mr Khodorkovsky, who was last month sentenced to a further eight years in prison for tax evasion. But, it was 12 months later with the auction of Yuganskneftegaz, the main production facility of Yukos’s empire, that Rosneft was propelled into the big time as the business was sold off to help settle the Yukos tax debt. Despite Yuganskneftegaz being one of the most attractive oil assets put up for sale in Russia, bidders proved elusive and in the end only two offers were made for the business; one from Gazpromneft, the oil business of state gas company Gazprom, the other from Baikalfinansgrup. If the second name is not familiar this is no surprise – the company was only set up two weeks before the date of the auction. Even more bizarrely, the company was registered in the Russian city of Tver in a building that otherwise housed a vodka bar, a mobile phone retailer, a travel agent and a handful of other small local companies. Yet this improbable bidder won the day, offering $9.3bn after securing a multi-billion dollar letter of credit from Sberbank, a state-owned bank. Four days later Baikalfinansgrup was bought by Rosneft. Maybe related, maybe not… hmmm. Over the last five years, Chinese submarines have been going to sea a lot more, at least the diesel-electric boats have been. This is worrying to other nations in the region, and the U.S. Navy, because it means China is training its submarine crews for war. Previously the Chinese kept their fleet in port most of the time. This was cheaper, although in wartime it meant that Chinese warships would not last long in combat against a better trained fleet (like the Americans, Japanese, South Koreans, or Taiwanese). Now the Chinese are building better quality subs and feel they may have a fighting chance, if they have better prepared crews as well. For China one downside of all this training is that the U.S. Navy has more opportunity to practice hunting Chinese subs. This is particularly true for American subs, which are well equipped with passive (listen only) sonar and are even more effective if they have a lot of sound samples for enemy subs operating underwater or on the surface. The U.S. has discovered that Chinese diesel-electric boats are rapidly getting quieter, apparently because the Chinese have learned more about advanced techniques for “silencing” subs. 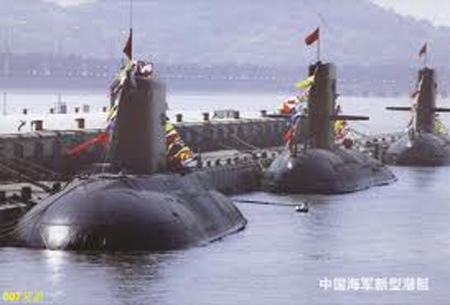 Still, most of the 60 Chinese subs in service are pretty noisy and easy to find. Meanwhile, the Chinese Navy has been designing and building a rapidly evolving collection of “Song” (Type 39) class diesel-electric submarines that emphasize quietness. The changes have been so great that the latest four Songs have been called Yuan class (Type 39A or Type 41). The original design (Type 39) first appeared in 2001, and 13 have been built.